I had severe trepidations about going to see Low at Club Academy, a utilitarian, impersonal cafeteria by day, and by far the worst of the Academy venues. Low’s music is pared down to the point where it almost feels as if you are intruding to listen to it, as it’s based around the softness of Mimi Parker’s voice and the invisible, unspoken kindedness between her and husband Alan Sparhawk. It cries out for closeness, calls for a straining to hear what’s not stated but implied. It needs an intimate setting with no distractions. This was a Christmas tour though, and no ordinary Low gig. Usually, singer Sparhawk’s level of interaction with the crowd is pitched somewhere between stern and untalkative and downright taciturn. Now though, jolly in a Santa hat, he looks relaxed, and jokes with the crowd, whilst bathed in a warm green light that softens the edges around Low’s sparse, often difficult sound. The classic three piece is joined by an extra percussionist, a ukulele player and strings. Low have, unexpectedly, become a pop band in between now and their last tour. They cover Happy Xmas (War is Over) by John Lennon and Yoko Ono, as well as giving a surprisingly successful rendition of Little Drummer Boy. Low had always threatened to become a pop band, and more conventional rock album the Great Destroyer is well represented. The band jigs about, enlivening the minimal set up of rudimentary drums, bass and less-is-more guitar, and the static tableau of stillness their songs often evoke. The expanded sound is effective on Shots & Ladders a dense, watery epic that sounds like you’re listening to it through some great muffler like the sea. The melodies are distorted as if they’re so fragile they had to be wrapped in cotton wool. It comes to you from some other dimension, like reality gradually breaking into a deep dream. Going to a Low gig can be an intense experience; this is more light-hearted, but the songs still sound like vessels carrying the inner weights of the whole band. Even carefree moments such as Last Snowstorm of the Year (which is, despite the title, Low at their most summery and jingly) have a certain sadness lurking at the back. The sliding, chromatic melodies of seasonal new single Santa’s Coming Over give it an eeriness at odds with the cosy traditional image of Christmas, although If You Were Born Today, Blue Christmas and One Special Gift are gentle and comforting as any carol service. The horrible Coming of Jah, however, tips the early celebration over into absurdity, with its calypso hooks, cod reggae beat and Sparhawk’s accompanying hand movements . Everything is redeemed, though, when Low close by building up into their apogee, Canada, a propulsive chant of joy. Photography, especially when it's presented in the bold contrast of black and white, offers heightened snapshots of what's around us. It often points out something that's obvious, but we might have missed the significance of somehow. A retrospective of Guardian photography celebrates the newspaper's staff photographers, who were based at the Guardian's Manchester office. It starts with the Guardian's first staff photographer, Walter Doughty, who was appointed in 1908 and continues through the six staff photographers who came after him, ending with Neil Libbert. A historical aspect is given to the collection, which spans the twentieth century, by the inclusion of vintage photography equipment such as the Muirhead Wire Machine, which enabled photographs to be sent by fax. Walter Doughty's photographs are strewn with the rubble of the early twentieth century, from memories of the first world war to the paranoia felt at the start of the second, which is encapsulated in a shot of Manchester road signs taken down to confuse the enemy. Doughty's photos encompass major events of the twentieth century including the 1926 general strike and early aviators. 'Irish Civil War Dublin 1922' frames a man's rear profile, stood in darkness, in a murky window pock marked with bullets. Denis Thorpe, who curated the exhibition, closes in on fleeting facial expressions, from rollerskaters to a bride on her big day. Tiny children are caught unaware learning the violin with the Suzuki method, and mid-yawn whilst eating toast and soup. Thorpe's camera engages with both personal issues, such as the tiredeness of a weary miner, and important events like the 1990 Strangeways siege. Tom Stuttard keeps an eye on the bigger picture, showing Chamberlain and Churchill in the 1940s, as well as everyday people and their eccentricities. A wonderful portrait depicts 'Mr and Mrs Bromley, Clock Collectors, Derbyshire, 1959' in bed, fenced in by their collection of clocks. An aerial view shows the road from Manchester to Sheffield blocked by snow. Bob Smithies too represents the political side of photography with his photo of a jaded man in a Manchester DHS office in 1970, as well as documenting confrontations between police and strikers in the 1970s and 1980s, a recurring theme in the exhibition, which is also referenced by Don McPhee and Graham Finlayson. Don McPhee's political portraits set Enoch Powell and Nelson Mandela out against a black background. Enoch Powell is particularly striking, his hands raised in front of him. 'Boxing Day Cowboys, Salford, 1973', however, is the type of token that can be found in any family album, zooming in on two serious little boys dressed as cowboys in a timeless moment of childhood. Often, the most enjoyable photos are chance snaps which elevate everyday life as we know it to a work of art, such as Don McPhee's shot of two farmers at a Yorkshire shire horse sale, clad in tweed, Wellington boots and warm woolen cardigans. Standing facing each other, hands in pockets, the shape between their two protuding, well-fed stomachs resembles an egg timer or the Rubin vase optical illusion. The exhibition shows how much has changed between 1908 and now, not just in photography – almost all of the photographs on display are in black and white – and the political climate of the country, but Manchester and Salford. Doughty's misty shot of St Ann's Square in 1921 is almost unrecognisable, as are the rundown Salford streets seen through the doorframes of derelict houses. Unless you can afford the best seats, an evening at the theatre often involves sitting up in the gods peering down at the tiny players on stage below. A new production of Shelagh Delaney's slice of life play Taste of Honey, however, throws the conventional theatrical experience out onto the cold Salford wind. DJ Jon Winstanley, who's providing a live soundtrack to the show, plays Northern Soul while we wait for the play to start, so it feels more like going to see a film at the cinema, complete with pre-movie muzak, than a formal trip to the theatre. By the time of the interval, I want to get up and dance. My 'seat' is a doorstep, an extension of the set. My feet touch the smooth, green-blue slabs of the Salford street below, which are wet with glossy patches of rainwater. Other audience members sit on a sofa, and a dilapidated brick wall on the edge of the stage. I can see the grain of the floorboards, worn smooth at the edges, and the glow of the cellar lights going down into the street. I can make out the patterns of the wallpaper and curtains, as well as the broken banister and the frayed carpet that doesn't quite cover the floor. I'm in the thick of things before the play even starts. When the players run on to the loud, brash blare of the Ting Tings, carrying their whole material lives in a wheelbarrow, the tenement comes alive, crackling with sexual tension and claustrophobia. We can taste the weak coffee and feel the coldness of the two room flat. We smell the smoke of the cigars and cigarettes Helen's boyfriend Peter (Paul Popplewell), a shady upstart with an eye-patch, smokes. The dripping ceiling leaks into a bucket like a tinny clock beat of decay, ticking with the regularity of a watery metronome. A lone light bulb flickers. We shiver in solidarity with the characters, feeling the chill of a city where “there are two seasons – winter and winter”. Sally Lindsay is the curvy, glamorous single mother Helen, a sexually voracious vamp with her blonde hair in rollers. An ageing alcoholic, she provides a contrast to her frumpy 15-year-old daughter, played by Jodie McNee, that would be tragic if it wasn't so humorous. Pinch faced and stick like, the mouthy Jo resembles Quentin Blake's scrawny depiction of Roald Dahl's precocious young girl Matilda. Helen and Jo are on first name terms, and more like an antagonistic, longsuffering married couple than mother and child. Perpetually chattering Helen barely gives Jo a chance to speak, and they have very few moments of calm in which to really talk. Taste of Honey is a play about relationships and power. It's almost a play of two bickering married couples; Helen and Jo, and Jo and Geoff. Geoff, a foppish, ginger haired art student played by Adam Gillen, is the play's main source of comedy, but also its main voice of reason. He cares for Jo when she becomes pregnant as the result of a then taboo mixed-race relationship. He steps into the nurturing role Helen should have had in Jo's life. The play, written when Delaney was 18, may have turned 50 this year, but updating it to include Manchester and Salford pop hits such as the Ting Tings' obnoxious, catchy Shut Up and Let Me Go, demonstrates that teenage attitude and bravado doesn't change over time. Even though Jo's future looks set to recreate Helen's adult life of “work and want”, she's irrepressibly upbeat and boasts “I can do anything when I put my mind to it”. Nor does the excitement of first love change over the years, providing hope against a backdrop of hardship and poverty. The characters sing and dance out their inner feelings to a cast of Manchester greatest hits that includes Oasis and Inspiral Carpets, Ian Brown, Happy Mondays and Northern Soul. It’s a form of escapist musical soliloquy: the characters can’t talk to each other - they’re too busy to listen. The songs of the Smiths are centre stage, the characters referencing famous lyrics such as 'I dreamt about you last night and I fell out of bed twice', and 'If a double-decker bus crashes into us, to die by your side is such a heavenly way to die'. It's a nod to the influence the play has had on popular culture, not least Morrissey's lyrics. Seattle band Fleet Foxes are sunshine personified, harking back to the golden days of West Coast pop and making bands like Crosby, Stills, Nash & Young sound fashionable again. They might have sung about snow and winter on White Winter Hymnal, but the crammed academy got even warmer as the harmonies of Quiet Houses enveloped the crowd in shafts of summery warmth. As four fresh-faced young men plucking harmonies out of the ether, Fleet Foxes don’t really seem of this time and place. A cold, rainy Manchester on a Sunday evening was abandoned for an early morning roll through the countryside. The soft, blissful melodies of Sun It Rises recreated the stillness of daybreak, while the band’s circular rhythm chug-chugged in the background mimicking the wheels of the first train of the day. A 1960s style guitar solo and bucolic banjo rung out of nowhere, like a sun starting to peep from behind hills and trees. A simple sequence of notes repeated, it was like a world tentatively taking its first steps at the start of a new morning. Chiming, silvery guitar caught like dew on spider webs. Fleet Foxes combine this kind of fragile beauty - crisp one note guitar lines - with solid pop songs and familiar, clattering sixties-esque drum beats. Songs like He Doesn’t Know Why already sound like classics, and Robin Pecknold’s voice is a personality in itself. He’s hairy and sweaty, but classically good looking, angelic even, like he’s stepped out of a portrait from an earlier century. Pecknold sung an echoing Oliver James by himself. Despite the starkness of the lyrics, the hope inbuilt in Pecknold’s voice, and an overexcited audience stamping along more or less in time, ensured it retained the aura of optimism that characterised the whole gig. SOME films are works of art and others, like Terence Davies' new film Of Time and the City, are literary, almost poetic, works. Veteran director Terence Davies narrates his new film, which ties in with Liverpool's year as Capital of Culture, in breathless, comforting undertones, like a much loved grandfather who's leaning over you to confidentially tell a bedtime story. While tinged with regret, in many ways Of Time and the City is very humorous. The highly personal film, documenting Davies' return to Liverpool, his home town, starts by reciting part of Ozymandias by Percy Bysshe Shelley, and recalling Alfred Edward Housman's nostalgic words 'happy highways where I went and cannot come again'. Davies goes on to reference James Joyce, Friedrich Engels and Carl Jung, but never strays away from the ordinary people of Liverpool, for example looking into the lives of women doing laundry. He often focuses on the very young and very old, as those who stand for Liverpool as it was and how it will be in the future. Twenty years ago, Terence Davies made a bittersweet, autobiographical film, Distant Voices, Still Lives, that was set almost entirely in the redbrick house he grew up in in the 1940s and early 1950s. Of Time and the City is similarly autobiographical, but places Davies' formative years, complete with burgeoning homosexuality and atheism, in a wider context: a Liverpool that was coping with poverty and rationing, and knew the value of 'happiness on a budget', an England that was giving street parties celebrating the lavish coronation of a new Queen and 'fossil monarchy' while the rest of the time it went without, and a world that was heading into the Korean war. The film, which is set mainly to clips of classical music - from Liszt and Mahler to John Tavener - also serves as a tribute to the golden age of cinema and Hollywood stars, and Davies' love of classical music. Of Time and the City is a poignant and emotional elegy to a lost Liverpool, one those places that we 'hate to love and love to hate', taking place almost entirely in a smoky black and white. Davies laments 'Where are you, the Liverpool I knew and loved? Where have you gone without me?'. Twenty first century Liverpool is so different that he's an 'alien in my own land.' As the Empire was on the decline, so was the Liverpool of old. Glimpses into house proud women cooking and scrubbing their front steps give way to images of demolition and vandalism. The Liverpool in Of Time and Only City seems like a faraway land of cobblestones, trams, horses and carts and hire purchase, although in reality what we're seeing took place in the not so distant past. It comes across as a strangely old-fashioned place. Davies juxtaposes an idyllic scene of light rippling on a duckpond with a reminder that homosexuality was illegal until the second half of the twentieth century. Whereas the film jolts into early, ultra-vivid colour footage for the wedding of 'Betty and Phil' and the opening of the Catholic Cathedral (the building of which cuts through the film), the everyday life of most Liverpudlians remained starkly black and white. Of Time and the City is remarkably coherent for a non-narrative film that is collaged from archive footage, and sweeps from everyday scenes of the docks and crowds watching Liverpool football club to swooping shots of the skyline. 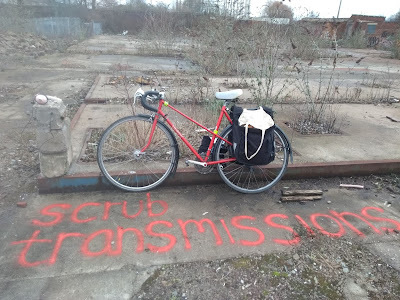 It's like we're watching a silent film – the music that accompanies the clips, from choral chanting to Ewan MacColl's 'Dirty Old Town', makes us feel as if we're cut off and peering in on history, outsiders trespassing on tableaux in someone's memory. The 'paradise' of tower blocks and new towns that were created after the war looks just as remote and detached as the leftover Victorian slum housing that was knocked down to make way for it. Davies uses footage panning over fearsome municipal architecture that shows the 'British genius for creating the dismal'. Whereas before, the crammed streets of terraced houses were alive with children playing in the streets and a sense of community, afterwards the overall impression is of desertion and emptiness, the new city skyline looking like an architect's model or toy town rather than an inhabited urban centre. I'm not from Liverpool, and I've only been there twice, but I felt strangely moved by the film, which ends up amidst the bars and shops of modern Liverpool. For all its problems, we're left feeling in awe of Liverpool, in all its glamour and majesty, as the camera soars over the Liver Building for the last time. SALFORD and Manchester, two cities next to each other but apart. To the rest of the world, Salford and Manchester are indistinguishable. However, in case you didn’t know, Salford is a different city marked out by the River Irwell towards the west of Manchester. Until the Industrial Revolution, Salford was more powerful than its more famous neighbour. We stole the Industrial Revolution from them, and now, says a new exhibition and map celebrating 50 years of Salford music, we’re taking credit for their music too. “You wouldn’t get Glasgow and Edinburgh mixed up”, says the Salford Music Map’s researcher, David Nolan, so why Manchester and Salford? Salfordians tend either to try and escape the city or wear their civic pride as a badge of honour. Being from Salford is sometimes seen as a mixed blessing: think of the 'Salford-Cambridge tones of Anthony H Wilson' (as we're reminded of in Mark Garry's BBC commissioned poem St Anthony, which can be listened to in the exhibition). Disappointingly, though, the Salford Music Map isn’t really a map but a line of locations - you won’t be able to use it to find your way around Salford or any of the venues. The ‘map’ is not drawn to scale; it promotes Salford as a tourist destination for visitors from both the UK and abroad, but you’re probably not going to track down all the sites, which are miles apart. 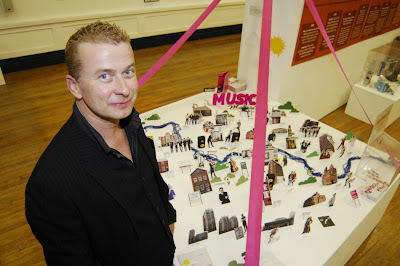 Nolan suggests you “invest in a car or a bus ticket”, but admits the Salford Music Map is “more of a thing to put on your wall”. Smiths fans already have Phil Gatenby’s books, Morrissey’s Manchester and Panic on the Streets, which contain instructions for foot, car and public transport and make for a fun musical tour around Manchester and Salford. Some of the stories on the map could do with further exploration in the exhibition. Who are the Kersal Massive, and are they really something Salford should be proud of? I was amused to learn that a successful In The City slot at the Kings Arms, probably the nicest venue in the whole of Manchester, let alone Salford, was responsible for letting histrionic glam rockers the Darkness loose on the world, and Mark E Smith could have had a successful career in shipping was it not for The Fall, but both stories are barely referred to in the exhibition. The German singer Nico, who has a section on the map, is virtually unmentioned. The 3D map on display in the gallery looks like something primary school children would create, with a big, jagged yellow sun peering over it optimistically. A river made of wool winds its way through cut out bits of paper indicating streets and buildings, some of which have already fallen over. The exhibition is more substantial than the map, however. There are star shaped sunglasses to dress up in, and a stage set up with instruments for future rock stars. There’s a recreation of a record shop complete with posters, fliers and 7”s, as well work by Ray Lowry - Salford-born cartoonist and creator of the iconic cover of London Calling by the Clash - who died recently. You can pick up a telephone and listen to the fuzzy tones of punk poet John Cooper Clarke. 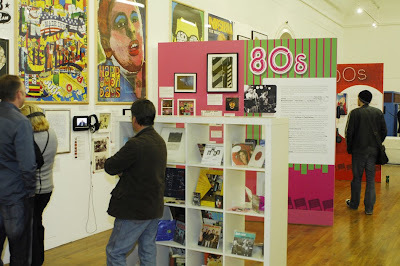 The exhibition is most interesting when it documents the 'development of a dirty northern city', to quote Mike Garry's poem again, and the changing ways we listen to music. Some sites on the map consisted of long-demolished terraced housing, and artefacts include a 1960s reel to reel cassette recorder, jukeboxes, Walkmen and IPODs. 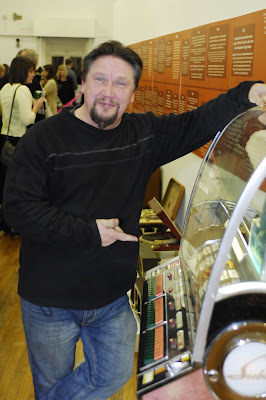 A timeline relates musical occasions to what was going on elsewhere in the world, and there are films of key players for the different decades, as well as a Salford music fan’s Teddy Boy suit. 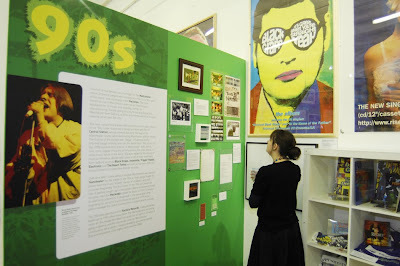 Bizarrely for an exhibition celebrating Salford, though, there's a big section on the Hacienda, which despite its various locations was never found in Salford. Perhaps because Salford doesn't have a recognisable city centre, Salford bands made a name for themselves playing in Manchester. It's not just Salford bands Manchester takes credit for, though: it's associated with lots of music that’s not strictly Mancunian. Doves are a Cheshire band, Badly Drawn Boy is from Bolton, Inspiral Carpets are from Oldham. The Charlatans, who the music map claims as Salford’s own, have tenuous claims to being a Manchester band, let alone Salford. Singer Tim Burgess grew up in Cheshire and now lives in LA. 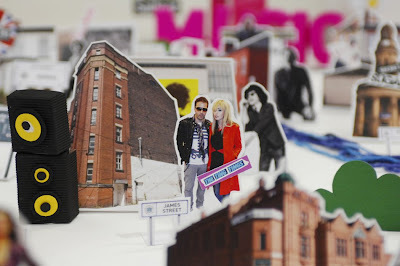 The map aims to find the future sounds of Salford, following the success of the Ting Tings. Bands like the Beep Seals look back to the sixties for their inspiration and are new, but not particularly futuristic. Nor is jaunty, brass heavy ska band The Mekkits. Salford's annual new music festival Sounds of the Other City is hardly a collection of Salford sounds, either. Fun and commendable as it is, and successful at bringing people into Salford who wouldn't normally go there, bands at this year’s event included the sublime David Thomas Broughton from Leeds, as well as Rozi Plain from Bristol and even a band from New York, Talibam!. For the real 'new' sounds of Greater Manchester in the 21st century, listen to bands like Cats in Paris, Denis Jones or Voice of the Seven Woods, who sometimes even play at venues in Salford like the lovely Sacred Trinity Church. However, Nolan hopes the exhibition and map will get “people to cross over the river who normally would have just gone to Manchester”. Quiffs, Riffs and Tiffs will be at Salford Art Gallery, Peel Park Crescent, until 28 October 2009. 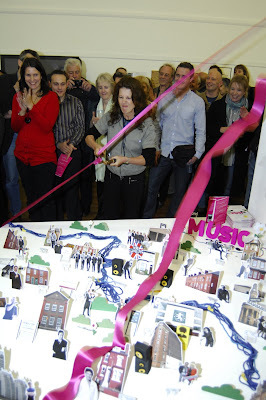 The Salford Music Map is free and can be ordered from www.vistsalford.info or picked up at the Salford Tourist Information Centre, the Salford Museum and Art Gallery and several of the venues on the map, including The Lowry, The King’s Arms, Salford Lads Club, Islington Mill and Salford University.